The second biggest, but for many people most beautiful planet in our Solar System. 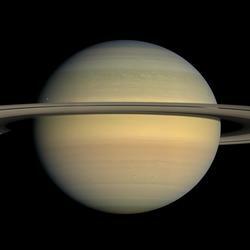 Saturn is 95 times more massive than our tiny Earth, but still just 30% of the mass of Jupiter. The rings consist of myriads of particles from the size of micrometres to a few metres and are mostly made of water, ice and rocks. Impressive as they are, the rings have an average thickness of just 20 metres. Saturn mostly consists of hydrogen, but it is believed to have a solid core made of iron, nickel and rock, between 9 and 22 times the mass of the Earth. As with Jupiter, don't imagine Saturn as a sphere of gas. Saturn is more like a huge ocean of liquid metallic hydrogen, liquid hydrogen and liquid helium; and above this ocean there is an atmosphere of gas. Due to electric current flowing within the metallic hydrogen, all gas giants have a strong magnetic field. The strongest magnetic field in the solar system belongs to Jupiter; it is 14 times stronger than Saturn's magnetic field (which is similar in strength to that of the Earth). Wind speeds in Saturn's atmosphere can reach 1800 km/h (or 1100 mph), making it the planet with the second strongest winds in our Solar System (after Neptune). For comparison: the Great Red Spot on Jupiter, a huge storm system that's been active for at least 200 years, has maximum wind speeds of 680 km/h at its edges. The strongest hurricanes on Earth reach 350 km/h over the open ocean. Saturn is the mother of one of the strangest storm systems in our Solar System: a hexagonal hurricane. There are at least 150 moons and moonlets orbiting the planet; one of them (Titan) is the only moon in the Solar System with its own atmosphere and complex organic chemistry. There are clouds and rain showers on Titan, as well as lakes and rivers (even river deltas). In short it has weather patterns similar to those on Earth. Another fascinating moon of Saturn is Encedalus. View our image of Encedalus to understand why this moon is so interesting. If you could stand on one of them your view would be spectacular. Just the low temperatures would be disturbing; Saturn has a temperature of approximately -139 °C on its "surface", by which we mean its outer layer of gas.